Arrow -- "Canary Cry" -- Image AR419b_0010b.jpg -- Pictured: Stephen Amell as Oliver Queen -- Photo: Diyah Pera/The CW -- ÃÂ© 2016 The CW Network, LLC. All Rights Reserved. Arrow — “Canary Cry” — Image AR419a_0131b.jpg — Pictured (L-R): Paul Blackthorne as Detective Quentin Lance and Katie Cassidy as Laurel Lance — Photo: Dean Buscher/The CW — ÃÂ© 2016 The CW Network, LLC. All Rights Reserved. The episode title is quite apt as there were plenty of tears being shed on my part. The death of Laurel/Black Canary is not only a blow to Team Arrow but also the show Arrow. I definitely shed the most tears every time Paul Blackthorne came on screen. Lance’s anguish at the hospital over seeing Laurel’s dead body to him first call Laurel his rock to correcting to she was his rock was super sad and tears streaming down my face. And for the first time this season, I really enjoyed the flashback. We opened the episode with a funeral. We think it is Laurel’s but it is actually’s Tommy Merlyn. We are in the year 2013 and Laurel steps up to speak a few words about Tommy because Oliver is unable to instead hiding in the shadows during the funeral. We must remember at this point in the story, Laurel has no clue that Oliver is the Green Arrow and even before Sara came back from the dead. Oliver later visits Laurel at her place and thanks her for speaking about Tommy’s funeral and says he couldn’t talk because he didn’t deserve to. Oliver believes that Laurel wouldn’t forgive him is she knew the truth about him and Tommy’s death and walks away. Laurel, of course, doesn’t understand what Oliver is talking about. Oliver returns and the two look over old photos and share memories of Tommy. Oliver then tells Laurel that she is the kind of person that wants to save the world and do the right thing, of course foreshadowing her career as the Black Canary. It is quite a romantic moment because at this point in time the two briefly reunited. Laurel tells Oliver that the two of them will save the world together. However, as we know, Oliver disappears to go back to Lian Yu and gives a letter to Laurel to say goodbye and in this letter is the photo of her that he kept while on the island. Arrow — “Canary Cry” — Image AR419b_0173b.jpg — Pictured: Paul Blackthorne as Detective Quentin Lance and Alex Kingston as Dinah Lance — Photo: Diyah Pera/The CW — ÃÂ© 2016 The CW Network, LLC. All Rights Reserved. Back at the present, two people are hit hardest over Laurel’s death. The first is her father. Lance is in denial that Laurel is truly dead. When there is a Black Canary sighting, Lance believes that Laurel faked her death. However, Oliver takes Lance to the morgue where Laurel’s body is still there. Lance then turns to Nyssa because he thinks she can take Laurel to the Lazarus Pit to resurrect Laurel just as Sara had been brought back to life. Nyssa tells Lance that she destroyed the Lazarus Pit and there is no way to bring back Laurel. Nyssa calls Oliver to tell him that Lance is still in denial and should speak to him. Oliver finds Lance at a local League hangout hoping to find clues for a way to bring Laurel back. Lance tells Oliver he doesn’t understand about a loss of a child but he counters to say he knows what it is like to lose both parents and they’ve both lost Laurel. This is where Lance tells Oliver that he feels loss because Laurel was the one to keep him together after Sara’s first death and she was his rock. Later at Laurel’s funeral, Dinah tells Lance that she believes Laurel will come back to them just as Sara has. Lance tells his ex-wife that this time their daughter won’t be coming back. With time travel in play over on Legends of Tomorrow and how that show is pretty loosy goosy with the rules of time travel, why can’t the team go back in time and get a Laurel shortly before her death and just bring back to the present? I still don’t not like how the show killed off Laurel and it is a startling trend how a lot of shows are killing off their female characters. The other person not taking Laurel’s death well is Diggle. Diggle blames himself for trusting Andy and if he didn’t, Laurel would still be alive. Diggle is so angry that he goes after Ruve Darkh and wants to kill her to send a message back to Darkh. The Green Arrow arrives and stops Diggle from going down that dark path. Later, Felicity apologies to Diggle for not being supportive and not for telling him he was not a fault. Felicity feels guilty too for being MIA as she felt she could have stopped Laurel’s death too. About those Black Canary sightings. “Black Canary” is seen again attacking Alex while on date with Thea. “Black Canary” attacked Alex because he was working for “them” meaning Ruve Darhk. Thea temporarily takes her down and Green Arrow takes over. This Black Canary stole Laurel’s sonic scream and starts using it on the Green Arrow, much to his surprise. “Black Canary” blames the Green Arrow for Reddington and only caring about saving his friends. Another Canary Cry later, she is gone. Once back at the Arrow Cave, the team is confused as to how this faux Black Canary can use the sonic scream since Cisco configured it for only Laurel’s use. Also, we learn that Reddington is that area where Darhk’s followers enter a chamber and then are sacrificed. The faux Black Canary is Evelyn Sharp (who apparently in the comics becomes a member of the Birds of Prey) and her parents were part of Reddington. That attack on Ruve and Alex? Well Ruve does some political spin on it blaming the Black Canary and other vigilantes too. Ruve issues an arrest warrant for all the vigilantes as she also blames them for the death of Laurel’s death that officially is she, in her duty as ADA, was caught in the Iron Heights prison riot. Team Arrow knows that Ruve knows that Laurel is the Black Canary and this faux Black Canary and her antics along with Ruve’s press conference is going to tarnish Laurel’s legacy. Felicity gets an alert that Evelyn is going to target Ruve at a fundraiser. When Ruve’s team is alerted about Evelyn presence, she doesn’t want to go to safety but rather wants to be attacked. Evelyn arrives and points a gun at Ruve ready to kill her but the Green Arrow arrives and says the real Black Canary wouldn’t want this to happen. The Green Arrow asks Evelyn to think what the Black Canary would want her to do. Evelyn drops the gun and takes off while the Green Arrow splits too before he can get arrested. In all of this I really hope Team Arrow gets back the sonic scream. 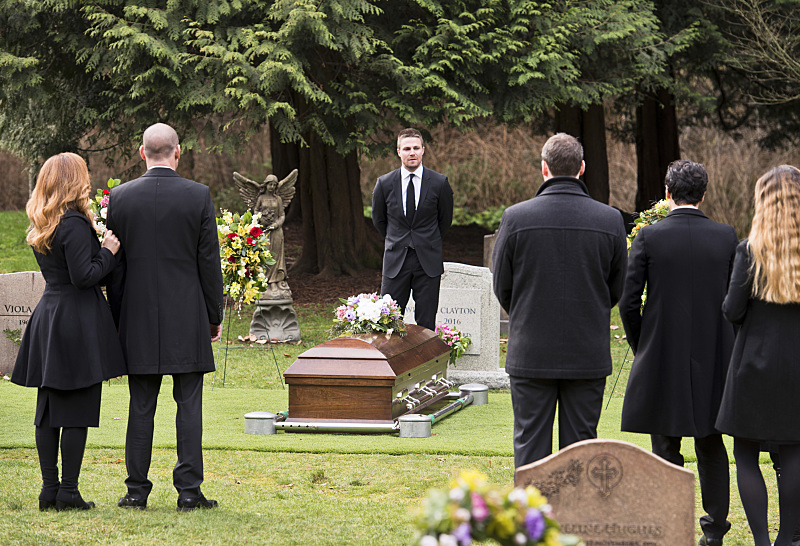 At Laurel’s funeral, Oliver speaks and says that shortly before Laurel died, she was the Black Canary. Oliver tells the people present that Laurel was a hero and what she stood for not only as a lawyer but also as the Black Canary. With the funeral over, we see Oliver has her tombstone (in real life this doesn’t happen that quickly) and we see it not only say “Dinah Laurel Lance” but also the Black Canary. As we’ve seen before, Barry arrives to offer condolences and apologies for not being at the funeral. Barry speeds away when Oliver wanted to be alone. Obviously this episode doesn’t match up to what is happening over at The Flash since Barry doesn’t have his speed but apparently this episode should have aired before that happened. Oliver goes to the limo and Felicity wants him to take down Darhk. Oliver says he doesn’t know how to defeat Darhk’s magic. Felicity says that one of the things she loved about Oliver is that he always finds a way because if he doesn’t then Laurel’s death will have been for nothing and she has to not only for her but also for Team Arrow.